Victorian Chapel Organ is a small but powerful instrument, perfect for small Houses of Worship or home organ practice. Victorian Chapel Organ does not use samples, leading to an extremely small application footprint. But don’t be fooled by its size. This organ makes some giant sounds, and at the same time will run happily on very old hardware, including iPad 2, iPhone 5C and iPod Touch 4G. The organ may be played with 2 MIDI controller keyboards and pedals attached, just 2 keyboards, or just a single keyboard. Despite having just 19 stops, the hollow flute tones of the Swell's Stopped Diapasons, plus its ranks of harmonically-rich reeds, perfectly complement the beautiful, classical smoothness of the Great. The organ offers a hugely flexible palette of sounds from its carefully-designed stops. And the organ's dynamic range is huge, the difference between a solo Vox Humana at minimum swell and all stops out / all couplers out is startling, just like a real church organ. 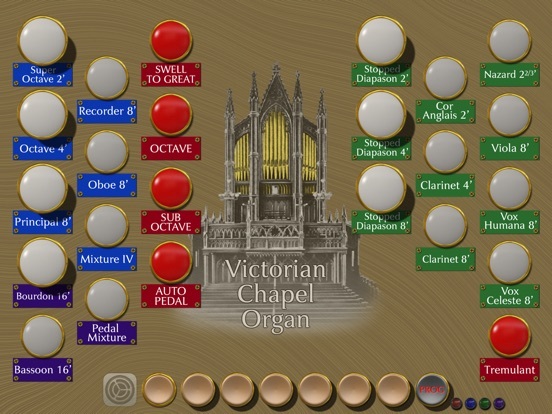 For those without daily access to a private chapel for practice, the organ contains an artifical reverberator that can be accessed within the 'Settings' page. Tremulant : acts on the Swell division. This makes the Pedal Mixture slightly tremulant as it uses Swell ranks. The Vox Celeste is tuned slightly sharp and is designed to beat beautifully against Vox Humana, Viola and 8' Clarinet. The entire console state of stops and couplers may be captured onto 7 pistons, allowing instant access to your favourite registrations. The pistons may be mapped to drum pads on popular MIDI controllers for even more rapid access to registrations. 4 on-screen LEDs give visual feedback to activity on the Great, Swell and Pedal MIDI channels, as well as helping when programming pistons. The LEDs are colour-coded, blue for Great, Green for Swell, Purple for Pedals. A new "Pipe Preparation" tool has been developed for this version, which extracts from recordings of organ pipes attack, release and harmonic fingerprint information. This tool allows for very realistic, very compact pipe models to be extracted from samples, and using this tool a significant revoicing of the organ has taken place. Realism of the organ is massively improved the over previous version, and version 1.3 gets close to the realism provided by massive sample sets, at a fraction of the memory footprint, none of the background noise, and a fraction of the cost. 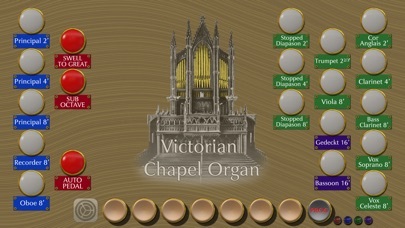 Finally an ultra-realistic pipe organ for your iPad and iPhone that doesn't consume all your device storage. Levels have also been rebalanced across the organ, and the Swell pedal response has been recalibrated for even more dramatic swells.